Kerberos is a protocol with roots in MIT named after the three-headed dog, Cerberus. Named because there are 3 parties: the client, the resource server, and a 3rd party (the Key Distribution Center, KDC). Kerberos can be a difficult authentication protocol to describe, so I will attempt to simplify it as best as possible. Kerberos authentication leverages long-term asymmetric keys (public key) and short-term symmetric keys (session keys). Asymmetric key cryptography uses two mathematically connected keys where one key is used to encrypt and the other is used to decrypt data. This is most commonly used in Public Key encryption (PKI) where one of the keys is kept secret by the user or service (Private Key) and the other key is available to anyone who wants it (Public Key). In this manner a user can sign (encrypt a hash with the private key) data to ensure it originated from that user without modification (the receiver decrypts the hash with the public key). Also a person can use the user’s public key to encrypt data so that only the user can decrypt it with the user’s private key. Symmetric key cryptography uses one key to encrypt and the same to decrypt the data. This is also referred to as a shared secret. Since asymmetric key cryptography is more processor intensive, it is typically only used to encrypt session keys which use symmetric keys (shared secret). Active Directory implements Kerberos version 5 in two components: the Authentication service and the Ticket-granting service. The Authentication Service (AS) is the first contact the client has with Kerberos and is used to lookup the user’s password and create the Ticket Granting Ticket (TGT). The AS also creates the session key the user will use for future communication with Kerberos. The Ticket Granting Ticket (TGT) is the Kerberos ticket for the Ticket Granting Service (runs on the KDC) and is encrypted using the KDC key (KRBTGT domain Kerberos account), meaning that only a KDC can decrypt and read the ticket. While the user’s ticket ,the TGT, is set to expire after 10 hours (AD default), it can be renewed as often as needed during the TGT renewable lifetime which is 7 days (AD default). Once the authenticating user has a TGT, it presents the TGT to the KDC to get a Service Ticket for the Ticket Granting Service (TGS) on the KDC. Most key Kerberos communication occurs over UDP port 88, though starting with Windows Vista & Windows Server 2008 now default to using TCP for Kerberos ticket requests. There is a myth in the Windows Kerberos world that if a workstation’s clock is skewed more than 5 minutes from that of the Domain Controller, Kerberos authentication wouldn’t work. Technically, all clocks in the Kerberos world must be kept closely in-sync to prevent replay attacks. By default, Microsoft Active Directory has a tolerance of 5 minutes. Though in most cases, this doesn’t mater. When a client sends a Kerberos request to a DC, the DC will reply with a “KRB_ERROR – KRB_AP_ERR_SKEW (37)” and the Windows client will update its time for the Kerberos session with the DC and resend the request. Provided the clock skew between the client and DC is not more than the ticket lifetime (10 hours by default), the second request will be successful. If the server clock and the client clock are off by more than the policy-determined clock skew limit (usually 5 minutes), the server MUST return a KRB_AP_ERR_SKEW. The optional client’s time in the KRB-ERROR SHOULD be filled out. If the server protects the error by adding the Cksum field and returning the correct client’s time, the client SHOULD compute the difference (in seconds) between the two clocks based upon the client and server time contained in the KRB-ERROR message. The client SHOULD store this clock difference and use it to adjust its clock in subsequent messages. If the error is not protected, the client MUST NOT use the difference to adjust subsequent messages, because doing so would allow an attacker to construct authenticators that can be used to mount replay attacks. KB956627 also describes this behavior. Every service that is Kerberos enabled has an entry point called a Service Principal Name (SPN) and each Kerberos user has a User Principal Name (UPN). For example, a user named Joe User in the ADSECURITY.ORG Kerberos realm aka AD domain (the Kerberos realm is always all Caps) has a UPN of JoeUser@ADSecurity.org. If Joe User initiates a connection to the share path \\server1.ADSecurity.org\Shared then Joe’s workstation will lookup the computer server1.ADSecurity.org in Active Directory and read its SPN attribute (cifs/server1.ADSecurity.org). 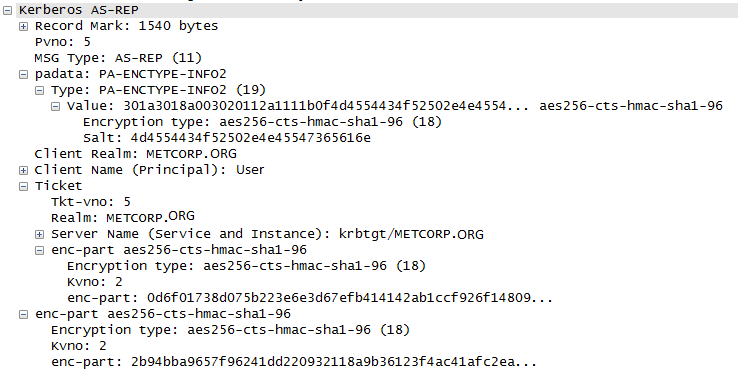 The computer SPN is used to identify the application server in the Kerberos TGS ticket request. Furthermore, when Joe opens Outlook, his workstation performs similar actions looking up the Exchange server’s SPN. As mentioned earlier, Kerberos has 3 components, the client, the server, and the KDC (trusted 3rd party). The process is similar to when you travel to a foreign country. (get the Ticket Granting Service ticket from the KDC – ok, so you would get the Visa from the country’s embassy, but you still need the passport and something authoritative the country’s immigration guard will accept). (present authoritative documentation to gain access to the resource server). 1. Joe User logs on with his Active Directory user name and password to a domain-joined computer (usually a workstation). The computer takes the user’s password and runs a one way function (OWF) creating a hash of the password (typically the NTLM hash). Hashing the password is like taking a steak and running it through a meat grinder. The ground beef that is the result can never be reassembled back into the same steak we started with. This is used to handle all Kerberos requests for the user (as well as other authentication methods such as NTLM). 2. Kerberos authentication is initiated by sending a timestamp (PREAUTH data) encrypted with the user’s password-based encryption key (password NTLM hash). 3. The user account (JoeUser@adsecurity.org) requests a Kerberos service ticket (TGT) with PREAUTH data (Kerberos Authentication Service Request or AS-REQ). 4. The Domain Controller’s Kerberos service (KDC) receives the authentication request, validates the data, and replies with a TGT (Kerberos AS-REP). The TGT has a Privileged Attribute Certificate (PAC) which contains all the security groups in which the user is a member. The TGT is encrypted and signed by the KDC service account (KRBTGT) and only the domain KRBTGT account can read the data in the TGT. At this point, the user has a valid TGT which contains the users group membership and is used to prove the user is who they claim to be in further conversations with a Domain Controller (KDC). The TGT is sent to the Domain Controller every time a resource ticket is requested. 5. When the user wants to access an AD resource (a file share for example), the user’s TGT from step 4 is presented to a Domain Controller (KDC) as proof of identity with a request for a resource ticket to a specific resource (Service Principal Name). The DC determines if the TGT is valid by checking the TGT’s signature and if valid, generates a resource access ticket (TGS) signed/encrypted with the KRBTGT account and a part encrypted with the Kerberos service account’s session key which the destination service uses to validate the TGS. Note: The DC doesn’t validate the user has the appropriate access to the service, it only validates the TGT and builds a TGS based on the TGT information. 6. The resource service ticket (TGS) is sent to the user by the Domain Controller and is used for authentication to the resource. At this point, all communication has been between the user’s computer and the Domain Controller (KDC). 7. The user’s computer sends the user’s resource service ticket (TGS) to the service on the resource computer. If the destination service is a file share, the TGS is presented to the CIFS service for access. 8. The destination service (CIFS in this example) validates the TGS by ensuring it can decrypt the TGS component encrypted with the service’s session key. The service may send the TGS to a DC (KDC) to validate the PAC to ensure the user’s group membership presented is accurate. The service reviews the user’s group membership to determine what level of access, if any, the user has to the resource. Here’s my example scenario to explain what occurs when a user logs on and opens Outlook to view his Exchange email. The bold text is the simple overview version while the detail follows. A user logs onto the domain ADSecurity.org on the workstation ADSecurityPC. The user requests authentication by sending a timestamp encrypted with the users password encryption key. 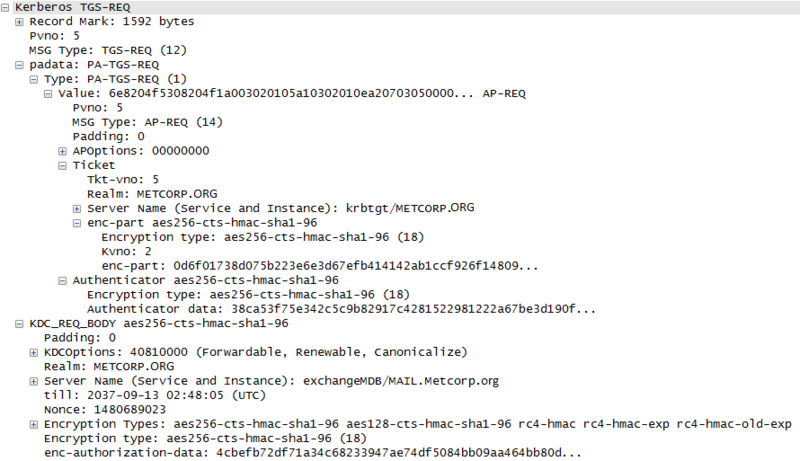 The Kerberos server (KDC) receives the authentication request, validates the data, and replies with a TGT. The user opens Outlook which locates the user’s mailbox server and requests a TGS ticket for access. The workstation locates the Exchange mailbox server containing the user’s mailbox (MetcorpEXMB02.ADSecurity.org) and reads the ServicePrincipalName attribute on the computer account in AD (ExchangeMDB/ADSecurityEXMB02.ADSecurity.org – there are a bunch, so I will just use this one for the example). The KDC validates the TGS request and replies with the TGS. The KDC replies with a TGS-REP packet to the client which includes 2 session tickets (TGS) (2?). One of the session tickets is encrypted with the user’s (KDC) session key ((C) key) and the second one is encrypted with the target server’s (KDC) session key ((D) key). The second TGS also includes the user’s group membership & associated SIDs which provides the server information used to determine authorization and help the server determine: Is the user allowed to access the server’s resource? The client authenticates to the Exchange server with the session ticket. The Exchange server replies that authorization to the service is granted. This is a simplified explanation of Kerberos and doesn’t cover everything involved in this process. There are different “tickets” that are used to authenticate a client to a server’s resource. The client can be a user or a computer. The Ticket Granting Ticket (TGT) is the first ticket given to the requester (user or computer. Transited: If the user is in a different domain than the resource, Kerberos tickets have transited.